Salida was already known as a cyclist’s paradise before mountain bikes hit the scene. The long, lonely, wandering blacktops that weave their way through the surrounding valleys and mountains make for some of the most beautiful and challenging road biking in the country. Throw the thousands of miles of dirt roads, doubletrack, and mountainous singletrack into the mix, and it’s easy to see why Salida has become a bucket list destination for roadies and trailhounds alike. Feel like rubbing cassettes with some other riders while you spin the grinders and bomb the downhills? Here’s a list of road races, enduros, cyclocross, and trail races for bikers of all shapes and sizes! Salida Bike Fest – This annual bike festival held annually in September in Salida includes the Chainless Bike Race, the Banana Belt Mountain Bike Race, and the Monarch Crest Crank road race, among others. Experience great racing, and even better times, over the course of this three day fall fest. Salida Classic Time Trial, Criterium, and Road Race – Now in its 13th year, this is a three-day winner-take-all celebration of road racing in, around, and through Salida, Colorado. Vapor Trail 125 – This invitation only, 24 hour enduro mountain biking race starts at 10 p.m. and finishes the following day, having covered 125 miles, over 17,000 feet of elevation gain, and is known as one of the most brutal, demanding, and rewarding mountain bike races in the country. Participants bike, walk, and carry (yes, carry) their bikes across some of the most challenging and beautiful country in Colorful Colorado. FIBArk Mountain Bike Races – Yes, it’s a whitewater festival. But it has mountain bike races too. 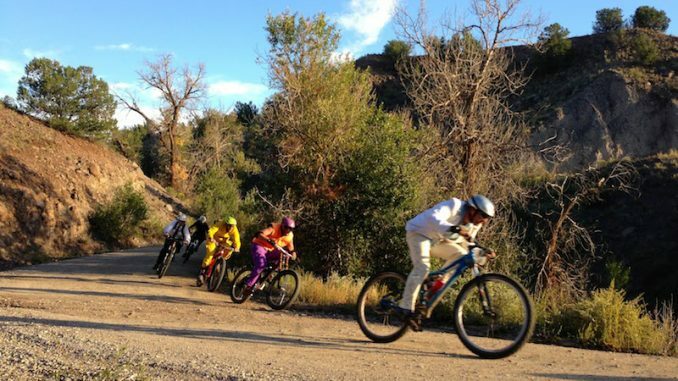 The Whole Enchilada Enduro – A tiered mountain biking race out of Salida, the Whole Enchilada Enduro features races ranging from 13.5 to 37 depending on your personal penchant for pain and levels of biking experience. Land Races: Keep Your Feet on the Ground!